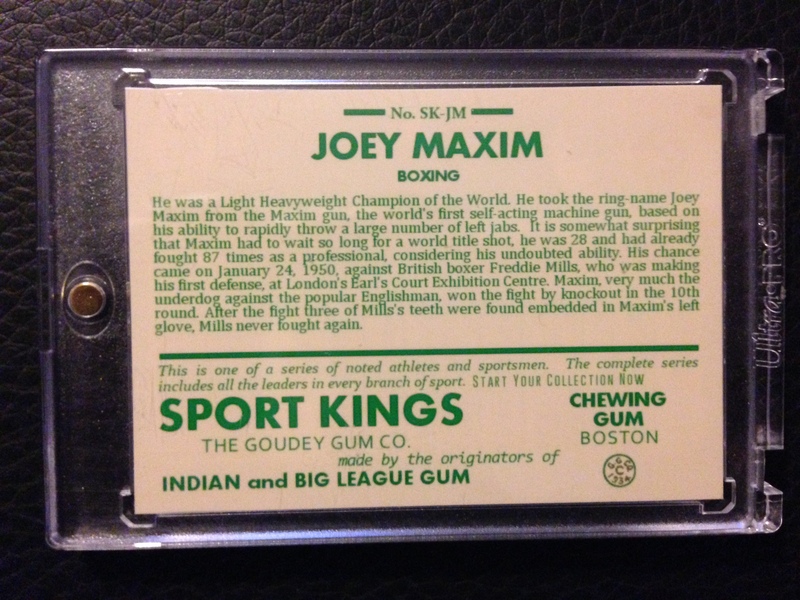 When you look at this card, you have the top prolific banner with the “Sport Kings Gum Text”, the player image, the sport caricatures, then finally the player name with white text on black. Those are the prominent features that I wanted to try and keep. Obviously the player picture had to go in order the fit in the cut autograph. But I wanted to keep everything else. Another concern was that many of the signed index cards I have tend to have long signatures on them. The kind that would go edge to edge on a card. For this reason I needed the card to not have side borders. So keeping this in mind I set out to make a custom card that would stay true to the original but had it’s own flare. I kept the banner at the top by cropping out the clearest one I could find online. Stretching it so that it fit the card lengthwise and tried to find a font that would match the original. The best place to find great fonts for free is Dafont.com if you haven’t been I highly recommend it. Once the top was designed it was time to attack the bottom. 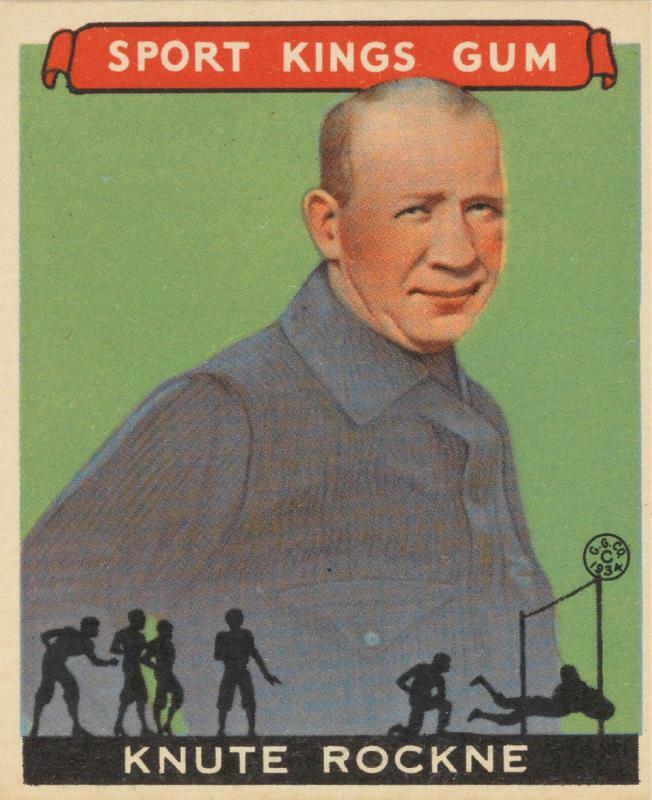 I needed those caricatures so that I could make a card for each sport. Since there have never been many boxing cut autographs I defaulted to cropping the boxing montage off of the Jack Dempsey card. Then placed it in the black player’s name box and split it in half to cap either end of the player’s name. Then used the same font as the top and boom the bottom was done. The problem was it looked bare. I needed to add some color. That’s where the blue comes from and in order to transition the blue to the off white base of the card, I created a black and white frame which I extended to the bottom of the card. This is a bit different than the original but I just felt it was necessary to give it a cleaner look .Finally I made sure that there was plenty of room on the edges to make my final trims and the front of the card was done. The back of the card was a different story. It’s green on light tan with about 5 different fonts. Not quite sure why the original goes this route but I decided to try and keep it. 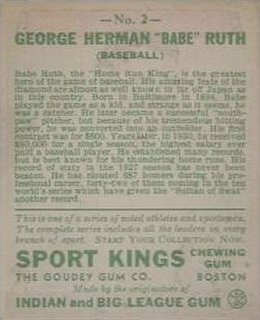 The key components in this one is the card number on top, the bold blocked player’s name, the player’s sport, a description of the player, a border, a description of the card series, the gum name, the parent company and the Goudey logo. I wanted to try and keep it simple, so that as a template it would be quick to update. Fist I gave myself a nice border cushion so as there is room for the edge trimming. I removed using an actual number and went to players initials as the numbering for this set. I like doing it this way so that there are no numbering mistakes. Even if I reuse initials, I don’t care as they still are a good representation of who’s card this is. So for Joey Maxim I went for SK-JM, I still flanked it with green lines. Then the sport comes into play but I removed the parenthesis. As I never did understand why they did that in the first place. The player description was lifted from Wikipedia, and the reference numbers were removed. Green border separator was added, then I just mimicked the bottom of the card as best I could. The Goudy logo was lifted off and original card and cleaned up so that it looked fairly crisp. In the end I think it came out terrific. I feel like I kept the integrity of the card with a nice twist to it to make it a cut autograph card. My plan is to use this template for Hall of Famers or Very Close to Hall of Famers only so no Cory Snyder cut auto. Tell me what you think.